About 10.2 million of all students enrolled in public schools, or slightly more than 20%, speak a language other than English at home. After English, the most commonly spoken language in the home is Spanish, followed by Chinese, French, and Hindi and related dialects. The share of Hispanic students who speak a language other than English at home is nearly eight times the share of non-Hispanic students who speak a language besides, or in addition to, English at home: 70% versus 9%. 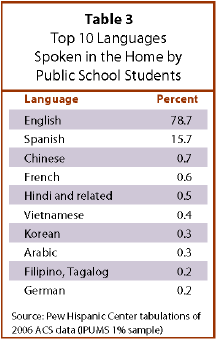 Although seven-in-ten (70%) Hispanic public school students speak a language other than English at home, most live in households in which at least one household member over the age of 13 speaks only English in the home or speaks English very well. Only one-in-five (22%) of Hispanic public school students live in a household where English is not spoken very well.10 But Hispanic students are 12 times as likely as non-Hispanic students to live in this type of linguistically isolated household. The share of Hispanic students who live in homes in which English is not spoken very well decreases considerably with each generation. Nearly half (46%) of first-generation Hispanic students do, compared with 28% of second-generation students and 3% of third-and-higher generation students. Of the 6.9 million Hispanic public school students who speak a language other than English at home, about 1.8 million (26%) speak English with difficulty; that is, they speak English less than “very well.” These 1.8 million students are 18% of all Hispanic public school students. As with linguistic isolation, the share of Hispanic students who speak English with difficulty decreases with each generation. While almost half (44%) of first-generation Hispanic students speak English with difficulty, this share drops by more than half (to 20%) among the native-born children of immigrants. 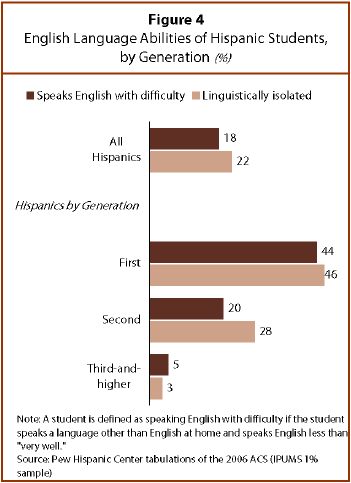 Among the third-and-higher generations, 5% of Hispanic students speak English with difficulty. Of the 10.2 million public school students who speak a language other than English at home, 2.6 million (25%) speak English with difficulty. Latinos account for 70% of all public school students who speak English with difficulty.